El Camaleón Golf Club at the Mayakoba resort is the 7,067-yard course designed by Greg Norman and managed by Fairmont Hotels & Resorts. It is unique – not just to Mexico but to the entire golfing kingdom. The course bends through three distinct landscapes – tropical jungle, dense mangroves, and oceanfront stretches of sand with holes bisected by massive limestone canals. There is even a cenote, a massive, ancient cavern common to the area, into the heart of the opening fairway. And as in all Norman projects, he has balanced the course to make it enjoyable for golfers of all abilities. From the tips, El Camaleón is a major league test, a real Shark bite. However, each hole is sprinkled with a minimum of five tee blocks, so there is a distance for every player. 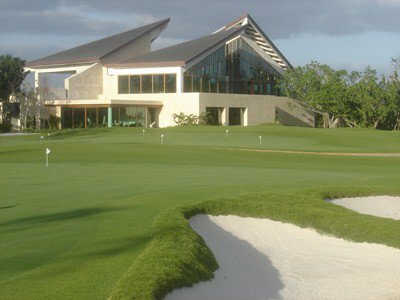 On February 19th, 2007, El Camaleón will be the host of “Mayakoba Classic”, PGA TOUR’s first official golf event in Mexico. El Camaleon Mayakoba is not yet in our pool of Golf Courses for orders.